GOP Staffer Resigns After Comments About Obama Daughters : The Two-Way Elizabeth Lauten criticized the first daughters for their actions and appearance during a Thanksgiving Day turkey pardon last week. President Obama, joined by his daughters Malia, right, and Sasha, center, speaks at the White House, in Washington during the presidential turkey pardon ceremony on Wednesday. Elizabeth Lauten, the GOP staffer who criticized President Obama's daughters, has resigned, The Washington Post, NBC News and USA Today are reporting. Lauten, communications director for Rep. Steve Fincher, R-Tenn., drew the ire of the Internet over the weekend for her comments about Sasha and Malia as they appeared beside their father last week during a turkey pardon ceremony at the White House. 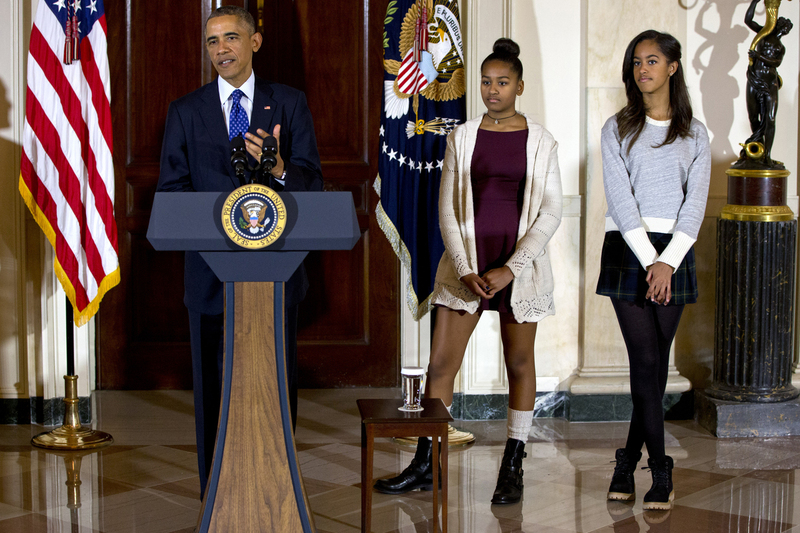 The girls gave their dad some interesting looks during the ceremony Wednesday, and when Obama asked if they wanted to pet the pardoned turkey, Sasha motioned, "nah." In a post on Facebook, Lauten criticized their clothing and asked the girls to "show a little class." "Rise to the occasion. Act like being in the White House matters to you," she wrote. "Dress like you deserve respect, not a spot at a bar." "Several media outlets pointed out that the two girls, ages 16 and 13, appeared bored while their father spoke during Wednesday's event. The exasperated looks on the pair's faces were used to gently mock the annual turkey pardon on social media Wednesday and Thursday and drew wry headlines from publications such as USA Today and Gawker. "But Lauten's comments struck a nerve among critics who accused her of going too far and turning the two girls into political targets. Her original post quickly went viral, inspiring blog posts and tweets condemning her choice of words. She issued an apology on Facebook hours after her initial post." 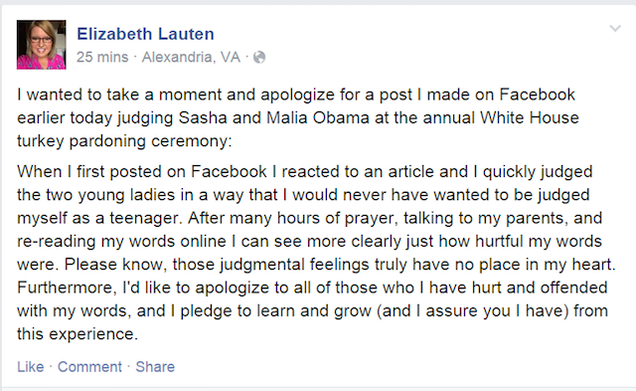 Lauten issued an apology on Friday via Facebook. "When I first posted on Facebook I reacted to an article and I quickly judged the two young ladies in a way that I would never have wanted to be judged myself as a teenager," Lauten wrote. "After many hours of prayer, talking to my parents, and re-reading my words online I can see more clearly just how hurtful my words were." USA Today reports that Fincher's chief of staff told the newspaper that Lauten had tendered her resignation earlier today.